Well there’s some good news for Newcastle fans today with the news that Newcastle have reopened talks for Bafe Gomis of Lyon, and now Sky Tyne and Wear are reporting that we are talking to former striker Demba Ba. 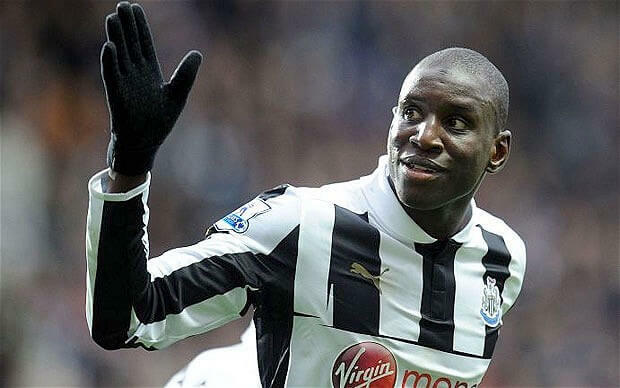 Demba Ba – could this striker be coming back to Newcastle? Sky Tyne and Wear are reporting that Newcastle officials have made contact with Chelsea over a possible loan move for the former Newcastle striker. With Joe Mourinho coming back to Chelsea, it’s obvious there is no future for Ba at the London club, and he didn’t even travel on Monday for the top game at Old Trafford. In an exclusive from Sky Tyne and Wear, the news is that the Senegalese striker is also being wooed by Qatar club Al-Jaish who have made an enquiry to Chelsea for the player. Ba would be welcomed back to Tyneside big time if he returns, after leaving Newcastle for Chelsea in January for around £7M, and Newcastle have been struggling ever since to score goals. Even though he left in January, Ba was still joint top scorer with 13 goals in the Premier League last term in just 22 appearances. And in the season and a half he was at the club, Ba scored a fantastic 29 goals in 58 total appearances. Papiss Cisse and Demba Ba never clicked on Tyneside, but wouldn’t it be a dream come true if Newcastle could get both Bafe Gomis and Demba Ba to Newcastle this week. Where’s those blood pressure pills – this is too much potential good news – all at once. But the Chronicle is reporting that if Newcastle can sign Gomis from Lyon, that would be it, and Newcastle would not pursue Demba Ba. That’s a pity if it’s true, because if Newcastle had more ambition, we’d try to get both strikers in, and Ba would not be too expensive on a season-long loan deal – not considering the number goals he could score for us. We really need to show more ambition at Newcastle. Hope its promising news but we wont get both so not sure which one I would prefer. I’d take Ba over cisse. My main fear of a loan is not just we might lose him again next summer but that we wont be able to use him right this year. If we sign him permanently then he can start ahead of cisse, if he deserves to based on performances, and if cisse is annoyed and wants to leave we still have Ba and can look for another forward next year. On loan if we play him ahead of cisse and cisse wants to leave come the end of the year, and ba goes back to chelsea…we will be left with nobody. Ba and Cisse could be direct competition for each other. Will he wear a shirt with wonga on it????? I don’t want Ba back. Yes he was great in a Toon shirt and I know he’d play well for us again but he could have stayed in the first place. Would he really be at his best mentally having taken a ‘step backwards’ to come and play for us again? I would rather see us tie up the Gomis deal. This lad looks built for the Prem and he’s something new, something different and something we can really look forward to. I’d love to see Cisse, Gomis and Remy, or 2 from those 3 up top. What we still desperately lack is real, true creative quality in our midfield. HBA’s decision making is poor at times – how many times did he chose to smash shots wide against WH? I’d love to see Hughes, Ince, Thauvin and so on…with Gomis, no Ba. Only player I can recall that was a real success story after we re-signed him was Beardsley – and Ba ain’t no Beardo. def have Ba back, he can get the job done, proven prem league striker, take him over Gomis. L’Equipe: Rennes full-back Dimitri Foulquier is to join Granada on loan, despite late interest from Newcastle. Please please please bring back Demba!! if we at all needed to give anyone an 8 year deal, i should have been Ba. Get him back Ashley! Ba over Gomis any day. Proven Goal Scorer, Proven in the EPL. We need to get the ball up to the box before anyone can put the ball in the net. We need wingers, pace, creativity. Agree, a winger and a CAM are a must, but with only 5 days left in the window there’s no chance! Arsenal have reached an agreement with Flamini! Cabaye to AFC looks dicy? Fair enough. I just think Ba seems to like playing football (and left to play at the highest level). He tried to step up and for whatever reason never got a proper crack at it…I think we are his level…he isn’t quite the player that top clubs want (not sure why). I’d take him back but new players are always exciting. Is it just me or does Pardew seem to be getting a bit pissed off with the squad not putting a shift in? That’s what I’ve taken from the last article, at least. Not an easy game tonight, mind. The lower league teams gave it a right bloody go last night so expect more of the same tonight. Cabaye to Arsenal looks less likely now, Arsenal are now said to be looking at Mata. I find it Amazing the moment there is some transfer news the likes of Lee ryder and Mark douglas are putting it down in minutes. I dont think demba went for the money more of the ‘next step up’. Think you’ve hit the nail on the head, Ba’s a very good player but he’s just not quite at the next level. I do not know which of Cabaye or mcCarthy is better. But McCarthy has not said one word playing in CC where as I can Imagine Cabaye kicking up a storm. Dimitri Foulquier bites the dust eh. When will this ownership realise the wisdom of getting transfer business done very early in the window. This club is an omnishambles! Now there’s a word for a banner! Mbiwa to captain side against morecambe tonight. I went to see the AFC Wimbledon vs Morecombe superclash last season in Kingston and to be fair Morecombe shouldn’t really give us any trouble tonight at all. They had a super little player called Jordan Burrow who would have given us problems all night with his pace and trickery but he’s been sold and the only other player they have worth looking at is Jack Redshaw. The rest are as you would expect are fairly mediocre and if we attacked their defence from the get-go they’ll be all over the place. We were sat behind the keeper and with some pressure from the crowd he’ll make silly mistakes. I’m hoping for a convincing 3-0.
wonder what team people would put out tonight. I was trying to think earlier and I was struggling with the lack of dpeth we have am struggling to find a team professional enough to get the job done tonight, while also looking forward to fulham. Would have Demba back in a heart beat and have a bit of friendly competition between him and Cisse for the starting spot. In a heartbeat! I hardly think that boycotting 2 / 3 games is going to liquidate NUFC, a bit drastic don’t you think? Massive difference between rugby and football, both are really good sports but football has a much wider audience hence a more attractive proposition if someone is looking to invest….hence the free advertising of Sports Direct, the ownership won’t change unless it is hit in the pocket. We all want to watch the game as I have said numerous times that the Man City game was the first one I have missed in 15 years…..rain, cold, sickness, bereavements have never stopped me from supporting my club home or away, but this lot have driven me to this. This mob have no line of communication so who do we the fans reach out to them? I’m open to any alternative suggestions you have other than boycotting. I never asked season ticket holders to boycott, just wouldn’t make sense as they have already paid, but season ticket holders don’t have to buy anything when they attend the games, boycotting all Sports Direct stores, refuse to spend your money in these shops!! I’m giving suggestions it may not be the solution and i’m certainly not preaching, as I say if you have suggestions I’m all ears!! I’d like to see both Gomis and Ba but if I had the choice it would have to be Gomis, I think his game is more suited to the way we will play….hoofball!! Demba will want to play through the middle and is one of the main reasons why Cisse was shifted out to the right wing, the manager has no bottle and will buckle again, Ba was good but time to move on. Remy and Ba in the same team. I would have thought Ba’s wages would be a sticking point as presumably he is on a lot more at Chelsea than he was here. I consider Remy as a Ba replacement so think I would prefer Gomis who would seem to be a more physical player and therefore a good partner for Cisse or Remy. I think any campaign against Ashley needs to start small. You will have a lot of people who dont like him but only few who would boycott games…need to get as many on side with small gestures like chants, pre game protest, sit in after game, all that sort of thing. The more you can get onside with things like that then the more who will stay onside when more action is taken. id play Cisse tonight, goals give strikers confidence, regardless of opposition and Papiss could use some of that before we play Fulham. Big problem with Ba is him and cisse in terms of a partnership where a shambles, cisse on the right was useless and ba on the left or right would not please him. That means if we bring ba in and drop cisse we have a player on loan probably playing alongside another player on loan and we will be in the deep stuff come the summer. On Cisse the lad is completely useless for us at the minute we all knew his wonder strikes would dry up and for me we cant afford a player who is only a poacher. The lad offers nothing else his general all round game is abysmal.You wont see many players in the modern game who only offer poaching ability and for me when cisse is one vs one he is terrible. Purely instinctive st who is generally in the right place at the right time. I would get rid if possible but all of the loan signings we may be making would leave us with a full forward line rebuild next season. Worrying times!